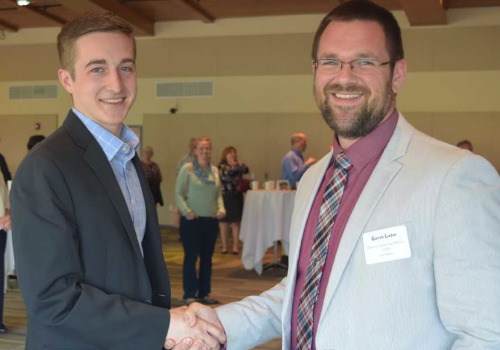 Gavin Luter has been named director of the UniverCity Alliance at UW-Madison, which connects students and educators with communities to solve local challenges. The Alliance, created in the spirit of the Wisconsin Idea, organizes the UniverCity Year program, which forged partnerships between UW-Madison and the city of Monona in 2016-17, Dane County in 2017-18 and, next year, Green County. In Monona, 23 UW-Madison classes worked on 30 projects, including parks and recreation, economic development and active transportation. In Dane County, 21 classes addressed challenge from water quality to housing. The kickoff for UniverCity Year Green County will be August 21 at the Monroe High School Performing Arts Center. The UniverCity Alliance was established by campus leaders from units including the Global Health Institute (GHI), the Nelson Institute for Environmental Studies, the Morgridge Center for Public Service, COWS and others. Luter replaces Jason Vargo, a former GHI assistant scientist who moved to become a lead research scientist for the Climate Change and Health Equity Program at the California Department of Public Health. Luter most recently served as executive director of the Wisconsin Campus Compact, where he worked with universities and colleges to change institutional culture to support community-engaged policies and practices. He has published several peer-reviewed articles and served as guest editor of a peer-reviewed academic journal on community-school-university partnerships and the intersection of school reform and neighborhood development. As part of his project work with the University at Buffalo Center for Urban Studies, Luter served as education planning director of the U.S. Department of Housing and Urban Development’s Choice Neighborhood initiative where he worked to secure over $16 million in commitments from 45 different philanthropic and higher education partners to create a neighborhood-linked education system.